I worry a lot about global warming — ice caps melting; temperatures rising; more frequent and severe droughts, floods, and storms; more pests; and the increased spread of infectious diseases. The scary list goes on, and it often feels like we as individuals are helpless to make a dent in this environmental crisis. But since the majority of these problems are the result of the lifestyles we humans have chosen, lifestyle changes can also make a huge positive impact. 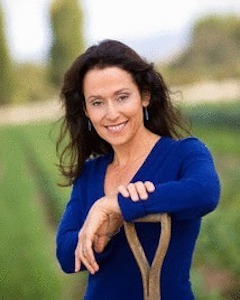 In doing research for my new cookbook, The Earthbound Cook , I learned that often the most effective ways to reduce our individual carbon footprint is to eat lower on the food chain. 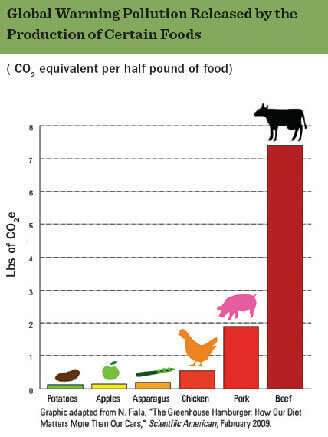 In the chart below (from the NRDC’s website), you’ll see the carbon dioxide equivalent of global warming pollution released by the production of different foods (equivalents are useful to compare different greenhouse gases; for example, cattle release huge amounts of methane, which is 21 times more potent than carbon dioxide). Just choosing the chicken instead of the steak at a restaurant has a notable impact — and if you choose to eat vegetarian, especially foods that use little or no cheese, your footprint is even lighter. Eating produce-based food is often more economical and healthier. Vegetarian proteins like beans and nuts have lots of fiber and no cholesterol. My family loves meat, but I’ve found that everyone is very satisfied with smaller servings if I make lots of delicious vegetable side dishes to fill us up and round out the meal. Eating this way doesn’t have to be a sacrifice at all; it’s healthy and delicious, and it can broaden your horizons.